In this tablet, Bahá’u’lláh reflects on the unique and world-transforming moment in human history when the Manifestation of God for this age, was born. From the beginning of the tablet to its end, He implores us, His ardent lovers, in verses replete with metaphors and allusions, to recognize the uniqueness of this night and to rejoice in its coming. This tablet is sublimely poetic and uplifting, and the more we immerse ourselves in its words, the more its joy and promise will penetrate our hearts. In this tablet, Bahá’u’lláh addresses His readers by means of various uplifting salutations: for example, “O Concourse of ardent lovers!” “O companions of the All-Merciful!” “O denizens of Paradise!” And He reiterates His call to rejoice throughout the tablet, with the words, “rejoice,” “joy,” and “joyful tiding” being used eleven times in the course of its 22 verses. From verses five to nine, various metaphors are used to invoke the magnitude of the renewal that has taken place as a result of the advent of the Manifestation of God. We read that “the veils of glory were parted before the eyes of the people of certitude,” that “the oceans of forgiveness surged and the breezes of providence were wafted abroad,” “the trespasses of all that dwell on earth were forgiven,” and “the assigned measures of bounty and grace were inscribed upon the scrolls of might and assurance,” and all this so that “every trace of sorrow might thereby be banished forever from all things.” Should we, as a result of our unworthiness, be inclined to waver, these verses assure us of the great mercy of God. And cups of crimson-coloured wine are being borne round by the hand of the divine Joseph and raised to the beauty of the All-Glorious. And this, verily, is from the grace of God, the Most Exalted, the Most Bountiful. The proof hath been fulfilled and the testimony established, inasmuch as the Resurrection hath come to pass through the appearance of God in the Manifestation of His own Self, the Ever-Abiding. And this, verily, is from the grace of God, the All-Glorious, the Most Bountiful. 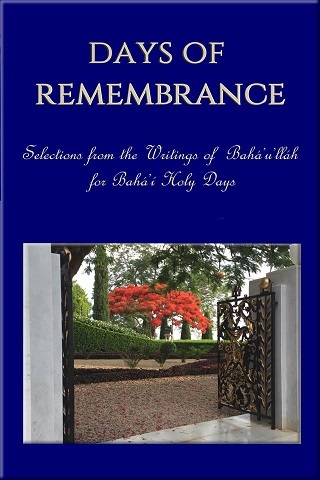 * Tablet 44 is reproduced in full below (Days of Remembrance, Bahá’í World Centre, 2017). 1. O concourse of ardent lovers! By the righteousness of God, this is a night the like of which hath never been witnessed in the world of creation. And this, verily, is from the grace of God, the All-Glorious, the Most Bountiful. 5. Say: This is the night wherein the veils of glory were parted before the eyes of the people of certitude, and the Bird of Heaven warbled its melody in the midmost heart of the celestial realm. Rejoice, then, O embodiments of sanctity in the Everlasting City! 6. This is the night wherein God shed abroad the splendour of all His most excellent names and established Himself upon the throne of every pure and radiant heart. Rejoice, then, O concourse of the Bayan! 7. This is the night wherein the oceans of forgiveness surged and the breezes of providence were wafted abroad. Rejoice, then, O companions of the All-Merciful! 8. This is the night wherein the trespasses of all that dwell on earth were forgiven. This, verily, is a joyful tiding unto all who have been created in the contingent realm! 9. Say: This is the night wherein the assigned measures of bounty and grace were inscribed upon the scrolls of might and assurance, that every trace of sorrow might thereby be banished forever from all things. Rejoice, then, O ye that have stepped forth into the realm of being! 11. Saying: By God! The musk-scented wine hath been unsealed by the mighty hand of Him Who is the source of sovereignty and power. And this, verily, is from the grace of God, the Most Exalted, the Most Bountiful. 12. And cups of crimson-coloured wine are being borne round by the hand of the divine Joseph and raised to the beauty of the All-Glorious. And this, verily, is from the grace of God, the Most Exalted, the Most Bountiful. 13. Hasten then, O concourse of men, and drink your fill from this stream of everlasting life! And this, verily, is from the grace of God, the Most Exalted, the Most Bountiful. 14. Say: O assemblage of true lovers! The beauty of the Desired One hath shone forth in its naked glory. And this, verily, is from the grace of God, the Most Exalted, the Most Bountiful. 15. O concourse of His loved ones! The countenance of the Best-Beloved hath dawned above the horizon of holiness. Bestir yourselves and hasten unto it with all your hearts, O people of the Bayan! And this, verily, is from the grace of God, the Most Exalted, the Most Bountiful. 16. The proof hath been fulfilled and the testimony established, inasmuch as the Resurrection hath come to pass through the appearance of God in the Manifestation of His own Self, the Ever-Abiding. And this, verily, is from the grace of God, the All-Glorious, the Most Bountiful. 17. The ages have passed, and the cycles have been stirred up, and every luminary hath beamed with delight, for God hath shed the splendour of His glory upon every tree adorned with verdant twigs. And this, verily, is from the grace of God, the Most Exalted, the Most Bountiful. 18. Bestir yourselves, O chosen ones of God, for the spirits have been gathered together, the divine breezes have wafted, the fleeting fancies have been dispelled, and the voices of eternity have rung out from every flourishing tree. And this, verily, is from the grace of God, the Most Exalted, the Most Bountiful. 19. By God! The veils have been burned away, the clouds have been rent asunder, the signs have been revealed and the allusions unravelled by Him Whose might is equal to all things. And this, verily, is from the grace of God, the Most Exalted, the Most Bountiful. 20. Let your hearts be filled with joy, but conceal this closely guarded, this most hidden secret, lest the stranger become apprised of that which ye have quaffed of the wine that imparteth rapture and delight. And this, verily, is from the grace of God, the Most Exalted, the Most Bountiful. 21. O concourse of the Bayan! God beareth Me witness that His favour is complete, His mercy is perfected, and His countenance is beaming with joy and radiance. And this, verily, is from the grace of God, the Most Exalted, the Most Bountiful. 22. Drink your fill, O My companions, from this sparkling and luminous stream, and rejoice therein, O My friends! And this, verily, is from the grace of God, the Most Exalted, the Most Bountiful. 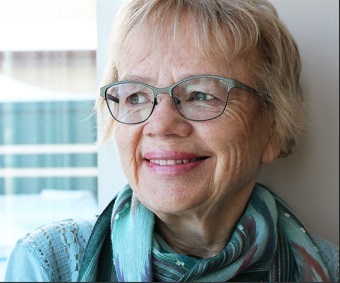 Bio: Patricia Verge’s books about indigenous peoples and the Bahá’í Faith include Equals and Partners: A Spiritual Journey Towards Reconciliation and Oneness, Wazin Îchinabi (2018) and Return to Tyendinaga: The Story of Jim and Melba Loft, Bahá’í Pioneers (2011, co-written with Evelyn Loft Watts).